When it comes to upping the nutritional quality of your diet, adding nuts such as almonds is a smart way to go. While you're better off eating unsalted almonds, raw almonds are not always the best choice. Not only are they harder to digest than the roasted varieties, but you may not get all of the nutritional value. Raw almonds have a rigid texture, which makes them difficult to digest, according to a study published in Food Biophysics in 2009. Portions of raw almonds are likely to remain intact as they go through the digestive tract, which may lead to abdominal pain and discomfort. Processing, which means boiling or roasting the nut, alters the hard texture of the almond, making it easier to digest. The tannins and phytates in raw almonds also make digestion difficult. These compounds act as protective agents for the nut, inhibiting the enzymatic reactions necessary for sprouting until the nut, or seed, is in a safe environment, explains dietitian Lily Nichols. Humans cannot digest tannins and phytates. Additionally, the phytates in the nut hold onto the minerals in the almond, preventing you from absorbing them. Simply soaking the nuts breaks down the phytates, which may improve digestion. Raw almonds are high in fiber, with 3.5 grams per ounce, which is equal to 23 kernels. 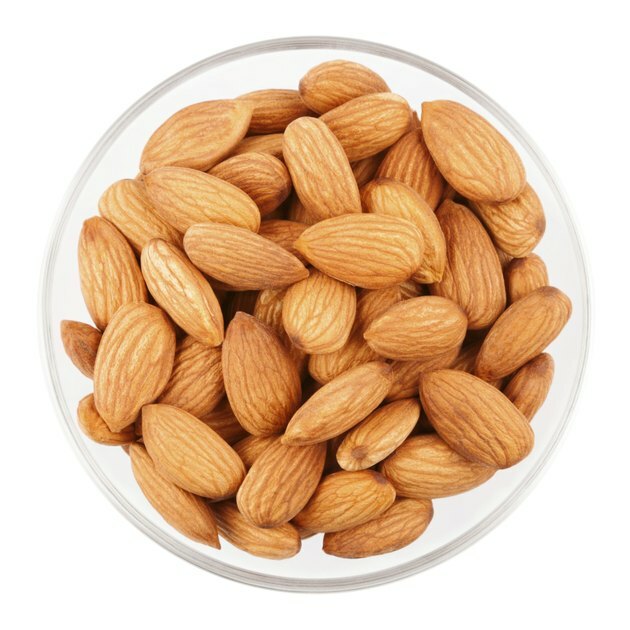 If you don't eat a lot of high-fiber foods, you may experience abdominal discomfort after eating a couple of raw almonds. It takes time for the bacteria in your intestines to adjust to the increase in fiber, according to the University of Michigan Health Center. When adding more high-fiber foods to your diet like raw almonds, go slow, adding small amounts day by day. And drink plenty of water to prevent constipation. No matter which type you choose, almonds are a concentrated source of calories. A 1-ounce serving has about 160 calories. To keep calories under control, limit your portion size, and eat your almonds in place of other sources of protein such as cheese, meat or poultry. You can enjoy your almonds as a snack or add them to your salad, yogurt or hot cereal for texture.